Glass skin is a hot trend that’s also perfect for the summer heat and you don’t necessarily need a 10-step skincare routine to achieve it! I know I just did a post all about how there’s a really long list of trends I love that intimidate me, but today I thought I would talk about a trend I’m loving right now that doesn’t intimidate me at all because it’s just so gosh darn easy to achieve: glass skin! 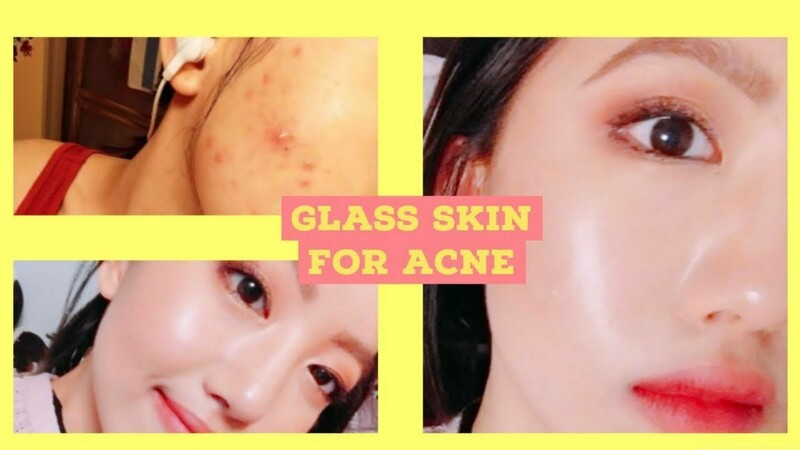 I know the term “glass skin” might remind you of an amalgamation of a certain character from a certain Spongebob episode, but it’s actually a K-beauty trend from last year that an article from Vogue largely credits LA-based makeup artist Ellie Choi for resurrecting in a big way after her Instagram post went viral. As you see above, Ellie looks super radiant, which she says is due to her skincare routine. Allure did an article quoting Sarah Lee and Christine Chang, founders of Glow Recipe, who say, “Glass skin is a skin ideal in Korea… It means skin that looks clear, poreless, translucent, [and] luminous — like a piece of glass.” The article goes on to say that you can achieve glass skin by “strobing with your skincare” and using multiple lightweight layers of hydrating products so skin looks dewy and plump. Sichen has probably the most beautiful skin I’ve ever seen and her tutorial gave me pure skin envy. She achieves her look using mostly cream products – a thin layer of foundation applied with a makeup sponge, cream contour, cream blush, cream eye shadow, and even an eye gloss paired with glossy lips to really up the glow factor. For her highlighter, she uses a cream highlighter first and then sets it with a powder highlighter from her cheek bones all the way up to her temple, her nose bridge, and her chin to achieve an all-over highlighted look. Another one of my favorite videos on this is by Lucy Lou, who has acne prone skin. I think this tutorial does a great job at showing that you don’t need to have perfectly airbrushed-looking skin in order to be able to achieve this look, which is one of the reasons why it doesn’t actually intimidate me. I like that she points out in her downbar that “the glass skin trend has recently took off in America even though South Korea has been rocking this trend for decades” – that’s right girl, call us out on our BS! She starts off by showing her skin prep routine, which is to cleanse, tone/exfoliate, apply serums/treatments, adding a moisturizing oil to her eyes and lips, and then moisturize. One of her tips that I thought was helpful was to add a drop of oil to your moisturizer to boost the hydration. When she gets into the makeup, she applies a smoothing primer as she says that the whole idea of glass skin is to have a smooth base. She uses a BB cream that gives light coverage and looks natural and blends it out with a sponge before spot-correcting with concealer, similar to what Sichen did in her video. She adds a liquid highlighter to her cheekbones, temples, and chin before setting her t-zone area with translucent powder and eventually setting that liquid highlighter with a powder one. She starts off by saying how important skin prep is and recommends slapping on your favorite mask and also preps her face using one part strobe cream and one part moisturizer to get a dewy base. She uses a tiny bit of foundation and spends her time really buffing it out, using a tiny bit of concealer later on to address any problem areas that weren’t covered well enough. When it comes to setting her face, she only lightly sets the areas she needs to in order to keep the max glow as possible. The real “a-ha!” moment in my head was when she started to highlight her face – she uses a Real Techniques blush brush, which is basically a large, fluffy, tapered brush, to create a very diffused natural glow. She buffs in her powder highlight all over the top of her cheeks into her eyelid area, which is a technique that blew my mind since I’m so used to seeing people apply highlighter using either a fan brush or a smaller pointed brush for precise application. I instantly fell in love with this method of highlighter application and it’s what I’ve been using ever since! If you’re no stranger to my blog, you’ll know I pretty much loathe any kind of foundation, so I tend to stay far away from it. While I consider my skincare routine pretty comprehensive, it’s nowhere near the routine suggested to get glass skin in the first place, so my skin definitely isn’t perfect, as you can see above! In my 23 years of life, I NEVER thought I would say that I like lipgloss since I’m always inclined to refer to it as the sticky devil, and being a girl who has had a very long love affair with matte liquid lipstick, lipgloss is so very off-brand for me. HOWEVER, Italy has been God-awful hot and humid and although I’ve never had a problem with the drying factor before, matte lipsticks have been a little too annoying to deal with when I’ve decided to just stop caring about everything, and I’ve found a few glosses that actually aren’t sticky. In my Insta above, I’m using the FENTY BEAUTY gloss bomb, which doesn’t feel goopy at all. The tl;dr on this is that glass skin has been around in Korea for awhile and we’ve only been catching onto it more recently here in the good old US of A. It’s mostly based on a hella long skincare routine that results in you having baby-soft skin, but you can fast-track the trend by using makeup. The key is a dewy base and a glowy highlighter so strobe away! Crazy concept but I love the post! I knew glass skin became a trend here that originated from Korea, but I never actually knew what it meant until now. Also, nice to know I’m not the only one who likes makeup, but doesn’t really care for foundation!